Since the thirteenth century, quay walls of significant retaining height have been built in the Netherlands in urban environments. Over time, structural revisions were often carried out due to excessive deformations or the use of increasingly larger and deeper vessels. These historic quay walls were seldom designed for the current functional requirements they are subjected to. These mostly older quay walls require more maintenance and revisions to secure a certain degree of safety. In some cases they need to be demolished and completely rebuilt. - quicksteps for the inspection of existing quay walls. Urban Quay Walls presents a proposal for a uniform and standardised method to verify the actual state of current quay walls in urban environments. 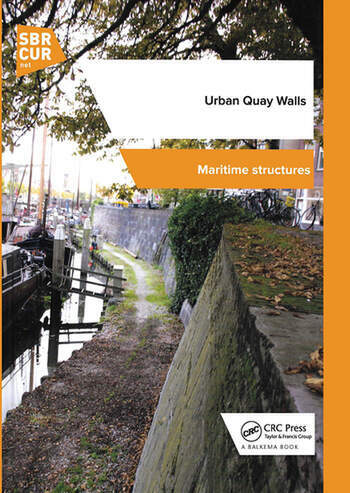 This handbook presents an overview of the development of urban quay walls over the course of time and describes the main types in use in the Netherlands. Subsequently, a method is presented for deciding whether or not a historic quay wall needs to be renovated, renewed or maintained. SBRCURnet is an independent knowledge network for the entire Dutch building industry. The knowledge and tools that SBRCURnet develops and provides, help corporate professionals and governments improve their skillsets and their business in both civil engineering and house building. SBRCURnet initiates and coordinates joint research projects with both public bodies and private companies. By initiating, organizing and publishing about these innovative solutions, SBRCURnet stimulates the further development of the entire industry. We do this because we believe that innovation is best stimulated by sharing knowledge and working together. Our focus is to link organizations in developing new knowledge on current issues. SBRCURnet issues approximately 500 publications about best practices and innovative building issues. Most of our research projects and activities result in the publication of guidance documents, many of which have been adopted as the standard for excellence in their respective areas. Although generally published in Dutch, some of our best publications (handbooks) are also published in English, for an international public. Edited by A.A. Roubos (Municipality of Rotterdam) and D. Grotegoed (Ballast Nedam Engineering).